Summer is here and once again Medici’s brings you The Premier Concert of the Okanagan’s summer music scene. CÒIG (Ko-ig) is an exciting super group of East Coast musicians, and is one of Cape Breton’s most captivating young bands. A serious force to be reckoned with in the traditional music scene with their driving tunes, haunting songs and infectious energy, Còig epitomizes the the very best in Canada’s East coast music gold. Fiddler Chrissy Crowley, from Margaree, Cape Breton has an impressive list of awards, nominations, and international appearances. Chrissy embraces her Celtic roots and puts the peddle down when the fiddle hits the stage. Darren McMullen, from Hardwood Lands, NS, is a highly sought after multi-instrumentalist switching between guitar, mandolin, whistle and banjo. He keeps the rhythm sound diverse, and is very impressive with his lead playing of his various “on-stage weapons”. Rachel Davis from Baddeck, Cape Breton is on very hard driving Celtic fiddle player. She plays traditional tunes in a traditional way. When Rachel and Chrissy Crowley let the fiddles fly on stage, you better buckle in!! Jason Roach, from Chéticamp, Cape Breton is one of the most impressive piano players you will ever hear. With a style all his own, and an unparalleled intensity on the keys, you’ll have to remind yourself that there’s other players on the stage. With a combined total of over 30 nominations and awards, each of Còig’s talented musicians have released their own successful solo albums, and have toured both at home and abroad before coming together as this exciting super group. Their debut album “Five” was released in June, 2014 to rave reviews, and has earned the band the 2014 Canadian Folk Music Award for Traditional Album of the Year. Tuesday July 28th Medici’s at 522 Fairview Road in Oliver is the only place to be..Tickets are $40 each. Seating is limited and planned. 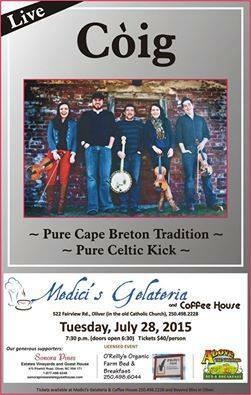 Doors open at 6:30 and the fiddles fly at 7:30…250-498-2228…Miss anything you like….just don’t miss this! !